Although you might not think of the Landmark’s Pappadeaux Seafood Kitchen as a mom and pop shop, the restaurant is family-owned by two brothers, Harris and Chris Pappas. The Pappas brothers opened their first restaurant in 1976, but the legend began decades earlier with their grandfather H.D. Pappas who left Greece in 1897 to pursue the American dream. After traveling to America, Pappas sought excellence and maintained a dedication to quality and service as he opened restaurants in Tennessee, Arkansas and Texas. Following in their grandfather’s footsteps, the brothers now have more than 90 locations in seven states including Texas, New Mexico, Ohio, Georgia, Illinois, Arizona and, of course, Colorado with different themes ranging from Mediterranean to Mexican. 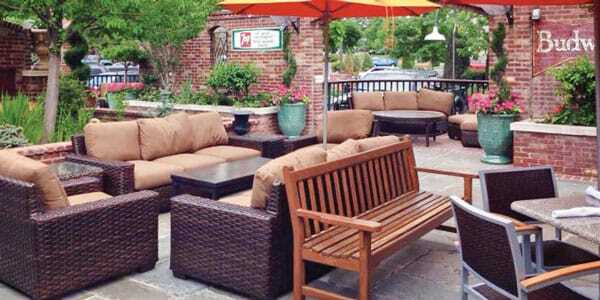 Pappas Restaurants is based in Houston and remains privately-owned and operated. In order to provide the absolute best for their guests and to ensure the highest quality products are used throughout, the Pappas organization owns and operates almost all aspects of the business, from driving their own meat and seafood delivery trucks, to employing the electricians who keep the lights on, to making the chairs for seating in the restaurants. This, along with the comfortable environment that keeps guests satisfied and coming back time and time again, sets them apart – no matter the location. Pappadeaux Seafood Kitchen is the largest concept in one of the largest family-owned and operated restaurant companies in the country. That being said, if you have a hankering for seafood, this is a good place to check out. If you enjoy the Cajun flavors of the French Quarter, then this is definitely a restaurant worthy of a regular stop. Upon arriving, the outdoor water feature and large entry porch are very inviting. Once inside, you will find the large and well-decorated bar, perfect for a quick bowl of gumbo and a glass of wine. If staying for the long haul, the vibrant and bustling dining room, abundant with tables and character, is casual and comfortable. 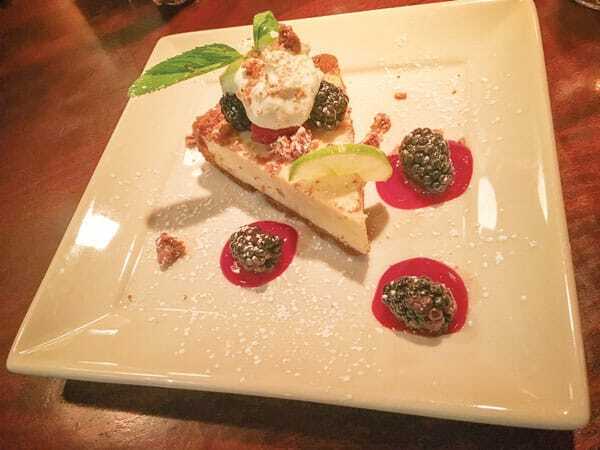 Although my husband and I were out for a date night, Pappadeaux is also a great place to take the family or spend time with friends for a special occasion. Once seated in the dining room, we ordered our drinks, among which the choices included Louisiana-inspired Purple Voodoo and Dirty South. I opted for a nice glass of Pinot Grigio, which is always a great complement to a night of seafood binging. We were then brought a warm and crisp heavenly French baguette with softened butter ready to be slathered on and enjoyed. We were hungry for oysters, and there were two oyster appetizers offered. A dozen gulf coast oysters on the half shell were $5 less than the blue point oysters. Well, what the heck, we decided to splurge on the blue point. I have to say they were some of the best oysters I have ever had, and I have had a lot of oysters. I’d say it was worth the extra money – hands down. While my husband ordered a Caesar salad, I decided to save room for the main course; crawfish étouffée. 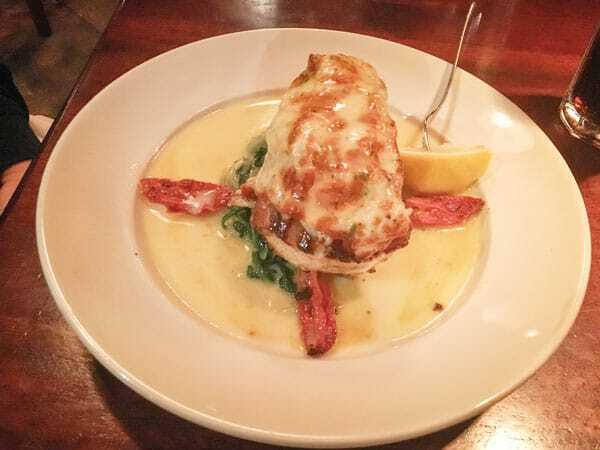 My other half went with the Chilean sea bass, which although it had a premium price tag, was a beautiful presentation and a delicious piece of fish that melted in your mouth… or at least so I am told. 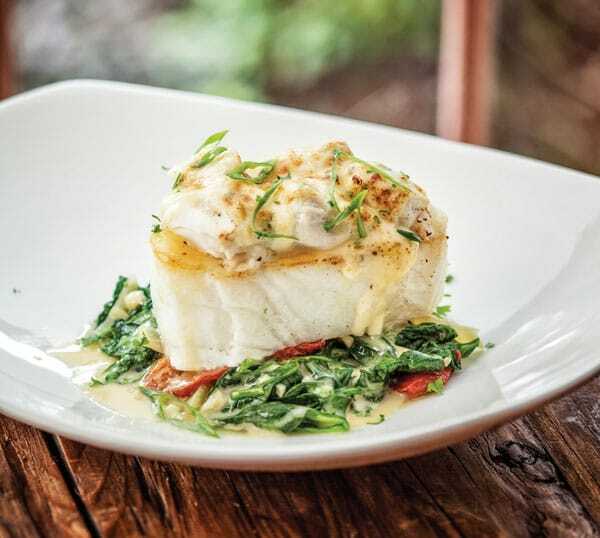 The sea bass was oven roasted with jumbo lump crab gratin on top, curls of sautéed spinach underneath and roasted tomatoes placed geometrically along the side for artistic flair. I was focused on my étouffée, which I hadn’t indulged in for several years. It was served over rice and was very tasty with a good amount of spice and tender and tantalizing pieces of crawfish in every bite. Both main courses, as well as the oysters were served with a slice of lemon skewered with a fork for an enticing squeeze of lemon to be sprayed on before digging in. My husband savored his entire meal, while I needed a box to take home my remaining rice and étouffée, which was served in a hearty portion. We were stuffed. Then again, “almost stuffed” we reconsidered when the extensive dessert tray came our way. There were so many tempting options from which to choose, including turtle fudge brownie, praline cheesecake, and sweet potato pecan pie. We indulged a slice of key lime pie, which came out as yet another lovely presentation topped with a skosh of lightly whipped cream, basil leaves, a few nuts, powdered sugar and several blackberries in a yummy, oozy blackberry sauce. The pie tasted like a fusion of key lime pie and cheesecake, and we gave it a big thumbs up, managing to devour every last crumb. All in all it was a great meal with excellent service. 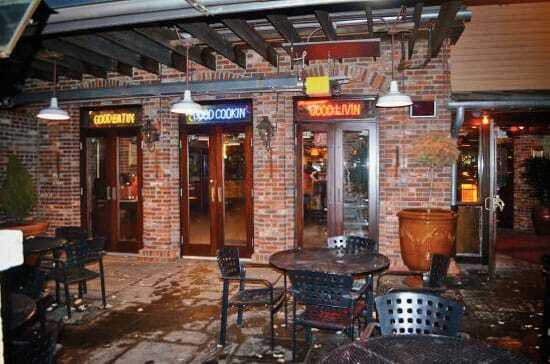 We were there on a weeknight, so there was no wait, but reservations are always recommended. We were in good company, with a fair amount of seafood lovers enjoying the atmosphere, their drinks and, of course, their food! So, if you’ve got that yearning for seafood or Cajun or both, make tracks to Pappadeaux Seafood Kitchen. Sun 10 a.m. – 10 p.m.